Many Instagram users have multiple IG accounts, perhaps a public facing Instagram profile (often referred to as ‘finstagram’, short for “fake instagram”), a more private Instagram profile (the “rinsta” for ‘real instagram’), a profile for their cat, dog, or turtle, and maybe even a business or work account they use and manage (why yes of course, osxdaily is on Instagram, give us a follow there). 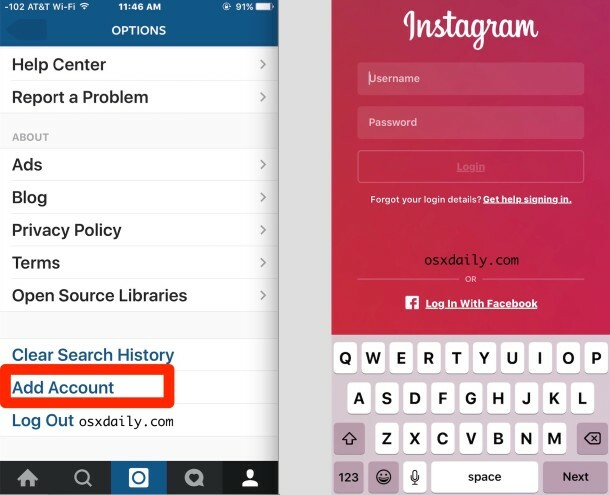 For a long time, Instagram users had to log out and back in to a different account profile to switch between multiple Instagram accounts, but now the Instagram app on iPhone (and Android) supports adding multiple accounts, offering a super simple method of switching different accounts directly in the Instagram app without any add-ons or hassles. Support for multiple Instagram accounts requires the latest version of the Instagram application to be installed on the device. 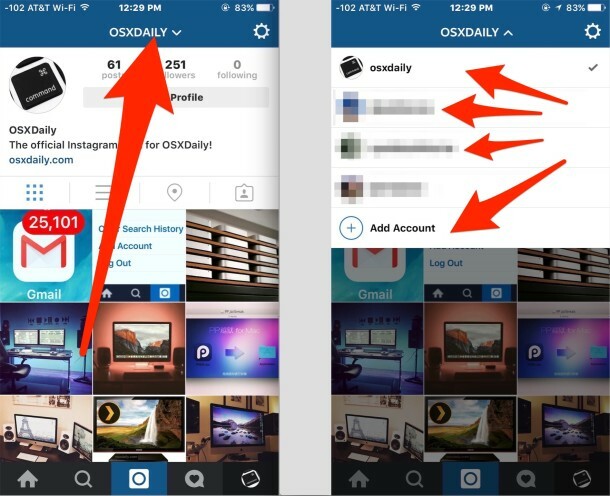 The feature is said to be rolling out so some users may not find it yet, but for all accounts we tested you can get the multiple account feature in Instagram now by doing the following: quit the app, then update it through the App Store, then relaunch Instagram, then follow the instructions below to gain access to this feature. 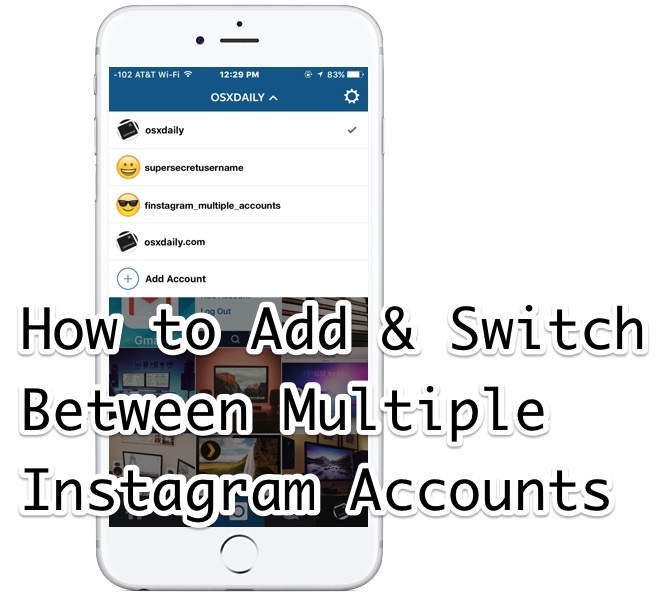 Now you have at least two instagram accounts which can be easily switched between by either log pressing on the profile button, or by tapping on the username from your primary profile view. Let’s cover switching between multiple accounts. * Don’t find the “Add Account” option in Instagram? You need to quit the app, update it to the latest version, and relaunch. You’ll see that once you’ve added another Instagram account, another option for “Add Account” also appears in the multiple accounts menu. There does not appear to be an obvious limit on how many additional Insta profiles you can add, so if you’re a professional Instagrammer, you’ll be thrilled with this feature. This makes it even easier to add future additional accounts, which is great for your personal and private Insta profiles, but also for work and business accounts, fan accounts, fun accounts, pet profiles, or whatever else you’re doing with the social network. Now all we need is full web posting and comment access, an iPad app, and a desktop app… but hey, multiple Insta accounts is a great start! Have fun. 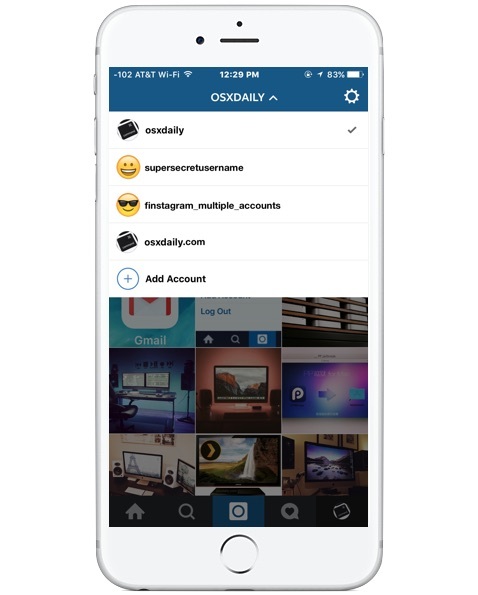 Don’t forget to follow osxdaily on Instagram too! We usually post pictures of Apple gear and Mac setups. And naturally we have other great Instagram tips and tricks to browse through as well, including making fancy wallpapers from Insta accounts, editing pictures without uploading them, and a snazzy Instagram screen saver too. Cool, worked for me exactly as described after updating the app. Now I have my rinsta and finsta setup. Piece of jc_cakes. I have what appears to be the most recent IG update in iOS — Feb 2 — (and have the most recent iOS update). The “Add Account” option is not present. WTH? I tried deleting and uninstalling. Didn’t work. Worked for me, but the feature is rolling out so it hasn’t gotten to you yet maybe. “Add account” (or the like) doesn’t exist in my Swedish version. …nor in the italian one.. The Add account option is not available. And I have downloaded the latest version advertising this ‘new’ feature. Nope, does not show up for me either after DLing the latest update. I would LOVE this feature ASAP. Guess I’ll have to wait until it becomes public. Went so far as to delete and re-install Instagram but have not gotten the Add Account feature. If you update the app and you don’t have it yet, you’re in the roll out. Please define “latest version of the Instagram application”. I’m on 7.15 – no sign of this feature. It’s cool, I didn’t know about it. So I can use my personal account and my business without headache! Can this work if the accounts are from different emails? Yes absolutely this works with multiple accounts with different email addresses, I use this to manage my work Instagram (with work email) and my personal Instagram (with personal email). Try it out, it’s a good feature if you juggle accounts.